Instagram is a powerful, beautiful platform to create awareness for your brand. There’s just one issue - there are so many brands on Instagram now! How do you boost your voice, grow your audience, and show that your brand is truly unique and special? Discover the tips and tricks to Instagram marketing with Selma Bamadhaj, co-founder of Lully Selb(@lullyselb) who grew their following of 10,000 followers through unpaid social media outreach. In this 4-hour workshop, students will learn how to plan a year’s worth of campaigns, all the features of Instagram at your disposal, and supplementary apps that helps you explore all your branding options. Through a mix of experience-sharing and hands-on activities, Selma’s workshop will teach you how to build a true community dedicated to your brand’s product, story, and work. 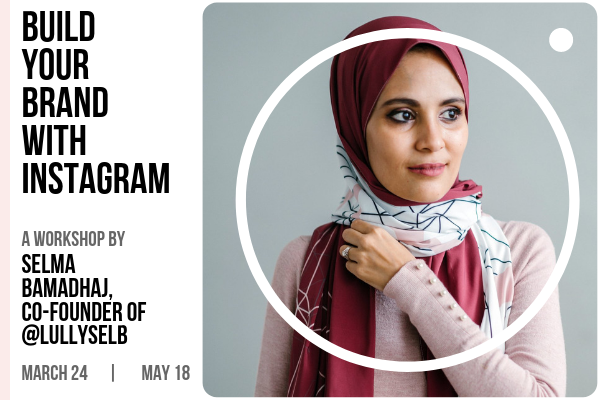 As the founder of local contemporary modestwear brand Lully Selb (@lullyselb), Selma believes in the power of Instagram to grow her community of women who seeks individuality and style. With a focus on original illustrations and modern graphic prints, Selma grew her online community of print lovers through social media, mainly Instagram. Lully Selb has been featured in leading press in Singapore, Kuala Lumpur and Middle East. In 2016, Selma celebrated her major milestone when Lully Selb’s story got featured on Forbes Asia for her social media marketing expertise. Just last year, Lully Selb’s work was recently presented at the Commonwealth Fashion Exchange, graced by HRH Princess Kate Middleton, Anna Wintour, Naomi Campbell, Stella McCartney, Adwoa Aboah and other fashion icons. Drop in your details in the form to register your interest and find out more!